Hi and welcome the the Spellbinder New Collections Inspiration Blog Hop featuring the new Happy and Gilded Age Products! You should have arrived here from Jacquie Dean's Blog. You can find a full list of designers participating in the Hop below. My first card features the new Shapeabilites Sending a Happy Birthday Etched Dies Happy by Sharyn Sowell. This die set creates such a cute scene! I created the background for the 5 x 5 card front by stenciling clouds and adding a border of patterned paper at the bottom. 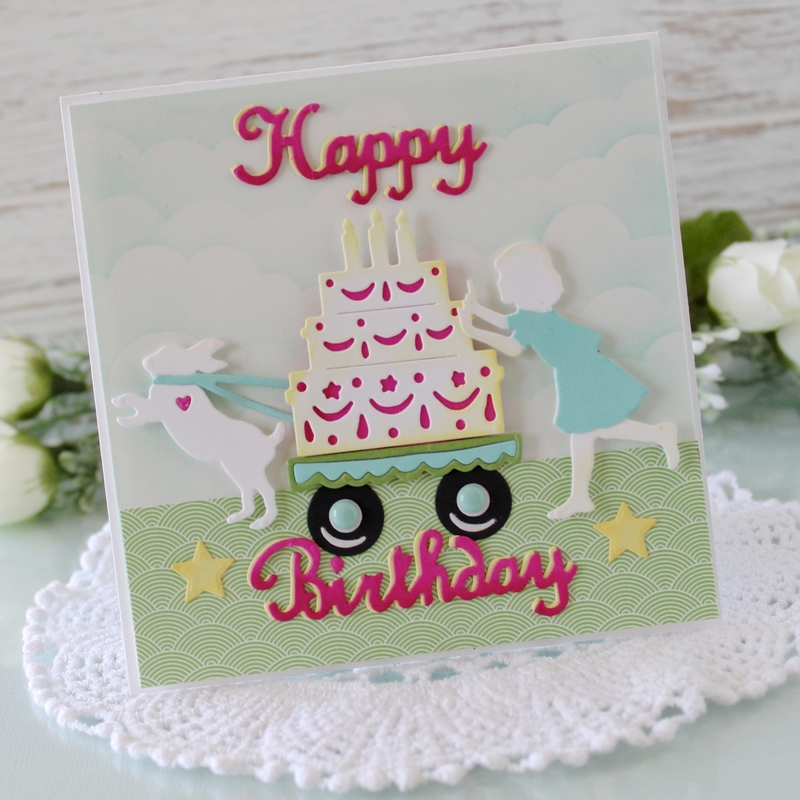 All the die cuts I used to create this card are included in the Sending a Happy Birthday Etched Dies Set, including the sentiment. I cut the little girl twice, once from white cardstock and again from a teal cardstock. To create the dress I cut off the legs, arms, and head. 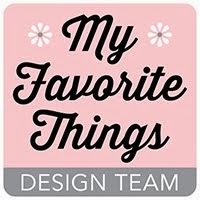 I also die cut the sentiment twice, once from a bright pink cardstock and again from yellow cardstock. Then I layered the pink over the yellow, offsetting just a bit to leave the yellow shadow. 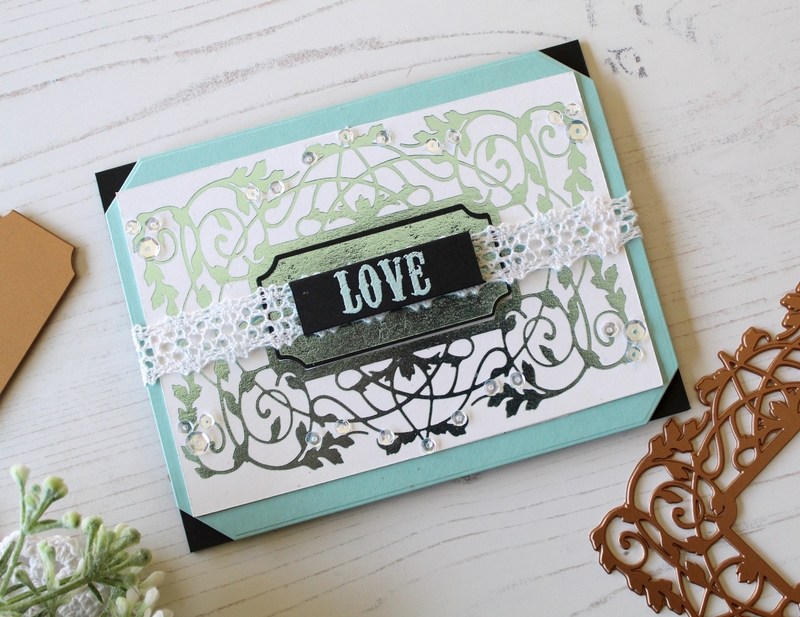 My second card is created with the new Gilded Vines Glimmer Hot Foil Plate The Gilded Age by Becca Feeken. I used the Glimmer Hot Foil System and Glimmer Hot Foil in Skybright to foil the die. The sentiment is from the Captured Sentiments Clear Stamp Set. I accented the foil with clear sequins and lace. To celebrate this release, we are giving away a $50 gift certificate to 3 lucky blog readers – selected from the comments across all of the blogs in the hop. Giveaway closes on Sunday, April 7th 11:59 pm EDT. 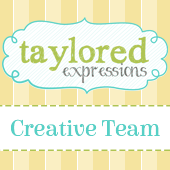 Winners will be announced in our blog hop post the following Monday. Winner is responsible for shipping cost, duties and taxes. Thanks for stopping by! Now hop on over to Desiree Kuemmerle's Blog for more inspiration. Wonderful cards. Thanks for sharing them with us. Great birthday card what fun it is, your second foil turned out really nice. Thank you for sharing your projects today! I love the birthday card; the color choices were beautiful and the composition was so lovely! The foiled card is very nice as well. Very pretty cards Melody. Especially love how colorful the first card is with all the different die-cuts... the gilded vine background is lovely on the second. I love both of your cards. The first is fun and the second is so swirly! One so whimsical and one so elegant. I love your cards! Your Birthday card is the cutest. Love it! The Love card is beautiful! Such fun and elegant cards! Great cards, the birthday card is nice and playful. Loving these cards! Great job. Your cards are beautiful! I love the interpretation of the dies! Two great cards! I especially like the LOVE card. 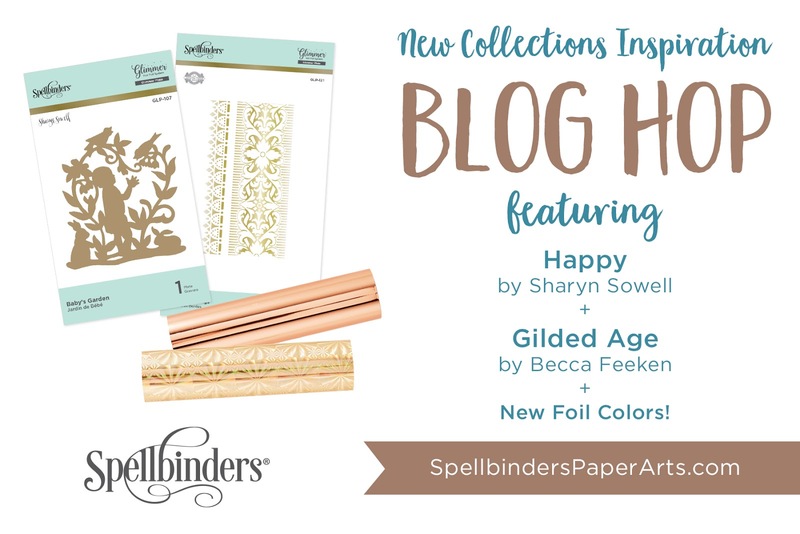 The foiled vine background is gorgeous! Beautiful cards. Love the addition of lace. Very creative. I love your cards, but the birthday cake with the little girl is so precious. Guess I will be shopping for the dies. Thanks for sharing. Your cards are great! The first one is such a fun card! Great cards! The Sending a Happy Birthday is so adorable that it is going right on my wishlist. Really like both but my favorite is the second frilly fancy card that shows off the foil beautifully. Thank you for sharing. Both are amazing! I love the scene you created with the first one! Wonderful cards! Thanks for the chance to win. OH my goodness, these are so cute!! 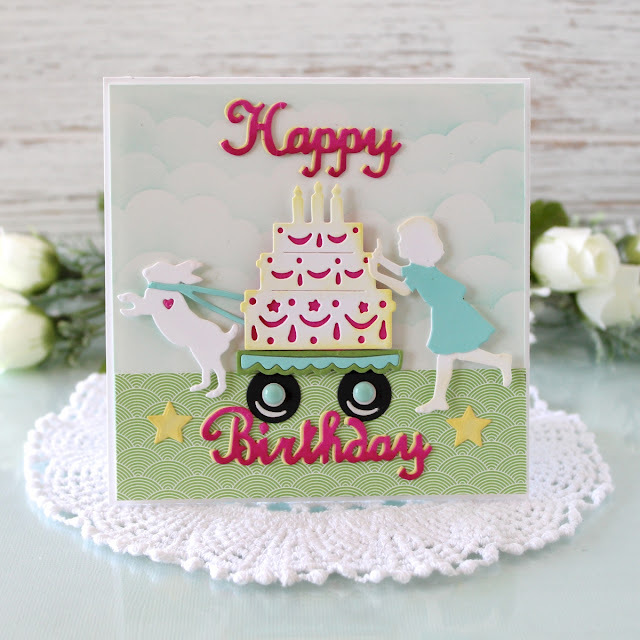 Sharyn Sowell's dies are so whimsical and fun but what you have done with her birthday die is such a delight!! The layering and your creativity really made that card fabulous! The gilded one is so gorgeously layered too!! I love that gilded vines Glimmer Plate, it's a must have. That Gilded Vines is really stunning. Great job on both cards. What a beautiful stunning card. Gorgeous cards! Love the whimsical look of the birthday cake being pulled in the wagon with the little girl behind and the elegance of the gilded vine foiled card. Thank you for the inspiration. That birthday card is so sweet and the Gulded Vines card is gorgeous. I love them both! The first card is full of fun, which a birthday card should be! And the 2nd card is very elegant and pretty. Love your cards. The birthday card is fun and the second card is very elegant and chic! The birthday cake is so fun. And the vines card is elegant! These are lovely. I am a huge fan of foiling. Your cards are so sweet! I especially love the birthday cake die. Love the cute scene on the first and the elegance of the second. Everything is done so beautifully! Love the scene with the first card. The second is elegant. Great cards. Both your cards are just beautiful. Love that light blue foil color you used for the second card! Awesome cards! 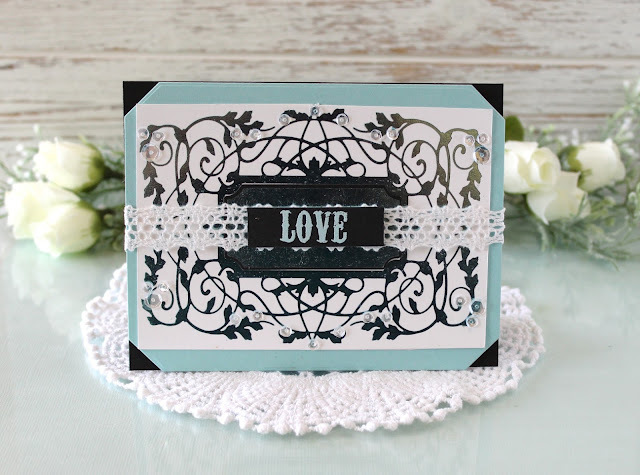 Love the charming scene you created for your fist card! Wow, sweet and elegant! Fabulous cards and amazing inspiration. What a lovely scene on the first card and the second card is so sophisticated and elegant. So cute! :) Love that first card! Love these cards. The first is cute. The second is very elegant. What a creative way to use the "Sending a Happy Birthday Etched Dies". Such a fun card. Lovely cards. The first one is so fun and the second one so elegant. 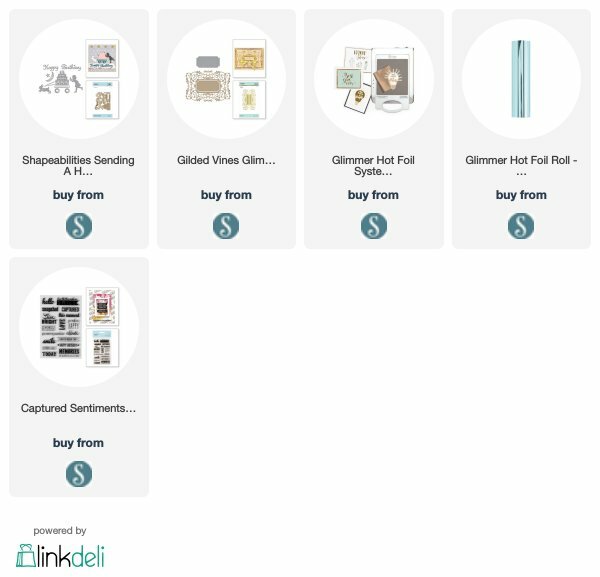 It's March Release Day at Pretty Pink Posh!